Delhi High Court Senior Personal Assistant And Translator Govt Job Typing Test Admit Card 2019 Check Here. Delhi High Court Senior Personal Assistant And Translator Exam Date Check Here. Delhi High Court Notification is out. Delhi High Court is recruiting for 73 Senior Personal Assistant And Translator Govt Job 2019 Posts. You can check Delhi High Court - Delhi High Court last date, download Delhi High Court notification, visit Delhi High Court official website and check other Delhi High Court Vacancy details.Complete Vacancy and recruitment Details about 73 Senior Personal Assistant And Translator Govt Job 2019 vacancies in Delhi High Court are provided below by JobSarkari.Com only for you. Last Date of Apply Online. 07/03/2019. Last Date of Pay Application Fee. 07/03/2019. Senior Personal Assistant 23 19 10 05 57. Senior Judicial Translator 01 01 00 00 02. Judicial Translator 09 03 01 01 14. Total No. of Post 33. 23. 11. 06. 73. Senior Personal Assistant Candidate Must Have Passed Graduation With Typing Speed of 110 w.p.m. in Shorthand (English) and 40 w.p.m. in typing (English) on Computer with knowledge of Computer. Senior Judicial Translator Candidate Must Have Passed B.A (Hons.) in English or Hindi or Urdu with Diploma/ Certificate Course in Translation From Hindi/Urdu to English, and Vice Versa OR Having 03 Years Experience in Translation work from Hindi/Urdu to English and Vice Versa in Central/State Government Offices/Parliament/State Legislature Secretariats or Central/State Public Sector Undertakings/Supreme Court of India/High Courts. Judicial Translator Candidate Must Have Passed Gradutaion with English/Hindi/Urdu as One of the Languages at the Degree Level and Diploma/Certificate Course in Translation From Hindi/Urdu to English and Vice Versa OR 02 Years experience in Translation Work From HindilUrdu to English and vice versa in Central/State Government offices/Parliament/State Legislative Secretariats or Central/State Public Sector Undertakings/Supreme Court of India/High Courts. Age Relaxation. 3 Years For OBC And 5 Years For SC/ ST And 10 Years For PH. 1. Candidate Have to Face Written Test of 75 Marks. 2. Candidate Have to Face Interview of 25 Marks. 3. There Will be 25% Negative Marking For Every Wrong Answer in Written Examination. 4. Candidate Can Apply Online On or Before 07th March 2019. Q. 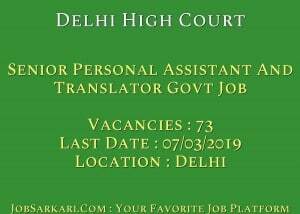 What is the Last Date For Delhi High Court Senior Personal Assistant And Translator Govt Job 2019 Vacancy ? A. Last Date for Delhi High Court Senior Personal Assistant And Translator Govt Job 2019 Posts is 07/03/2019. Q. 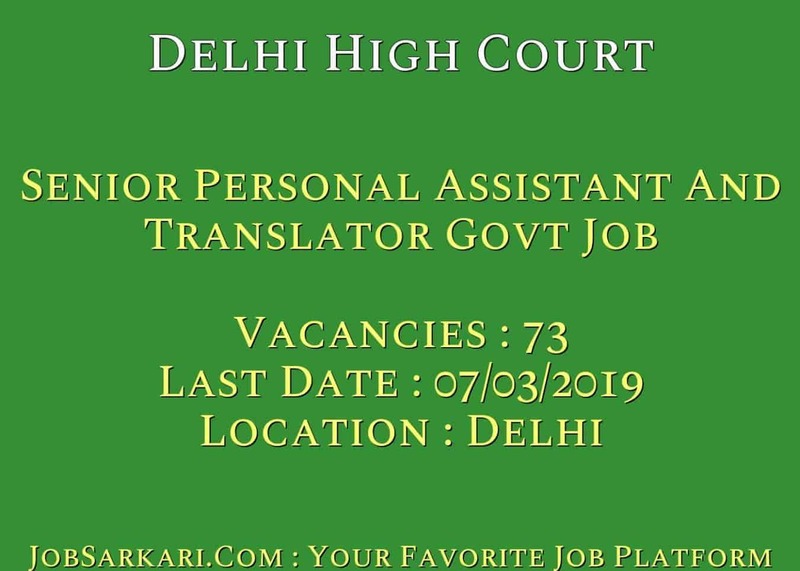 What is the Form Type of Delhi High Court Senior Personal Assistant And Translator Govt Job 2019 Recruitment ? A. The Form Type for Delhi High Court Senior Personal Assistant And Translator Govt Job 2019 Posts is Online. Q. How many vacancies are available in Delhi High Court Senior Personal Assistant And Translator Govt Job 2019 Posts ? A. There are about 73 Vacancies in Delhi High Court Senior Personal Assistant And Translator Govt Job 2019 Posts.